A short bus ride from Nice is the charming village of Villefranche-sur-Mer with a picturesque castle perched on a hill overlooking the bay. We spotted it on our way to Saint Jean Cap Ferrat and decided it was definitely worth a return visit. Boy, were we right! Nice is a walkable city and even if the distances are a little greater than you feel up to tackling there is always public transport. Nice has numerous museums and during our month long stay we did our best to see as many as possible. Even if art isn't your cup of tea the stately homes, palaces or contemporary buildings that house these various museums are definitely worth a look see (as are the various Nice neighbourhoods). We began with the Matisse Museum located in the chic Cimiez area. Castle Hill is a Nice landmark and one we see every day from our housesitting apartment. It's no surprise Nice appeals to creative individuals. Henri Matisse lived here for 37 years and one of the buildings he called home (the tall yellow one in the centre below) is close to the Mediterranean, Quai des Etats - Unis and the Cours Saleya daily flower market. Most of the clay rooftops visible in the header photograph above are part of the old town proper and this section of Nice is a must see for anyone visiting the area. The wonderful thing is it's not just a tourist destination all dolled up like a Disney set. It's home sweet home for a great many Nicois. We arrived mid January to begin a month long house and parrot sit in Nice, France. 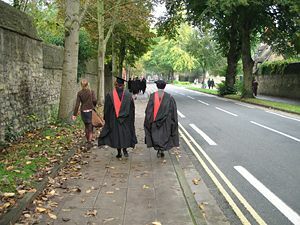 As mentioned in Part I Oxford is known as a 'town and gown' community and during our stay we actually did see a couple academics wearing gowns.